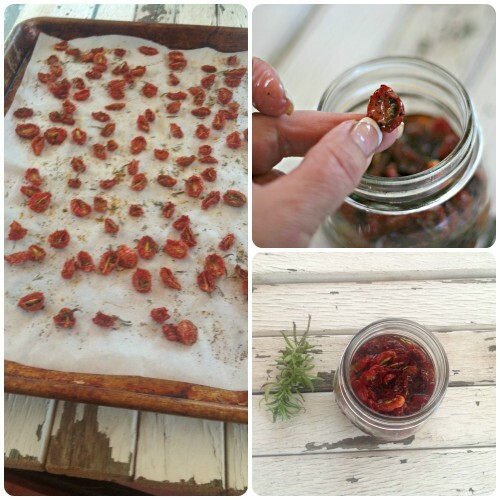 Do you love sun-dried tomatoes like I do, but not the price? 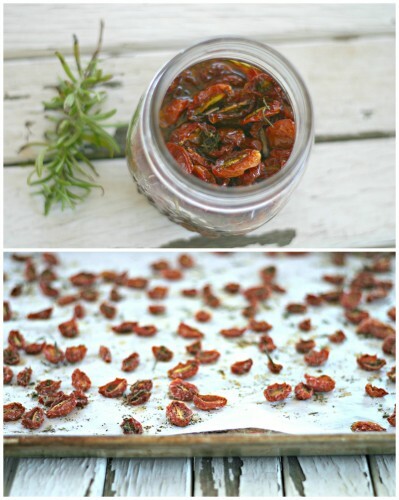 I am a huge fan of sun-dried tomatoes and last night I decided to make them at home. 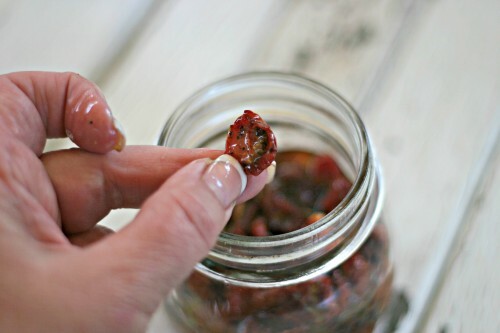 I experimented with both cherry tomatoes and plum or Roma tomatoes and let me tell you, homemade are absolutely wonderful. While these are technically “oven-roasted”, they came out gorgeous, much redder and with deeper flavor than any I’ve bought in the store. Now it has spurred me to ask Mr. Wonderful to make me a covered drying rack to try to actually make them outside in the sun. Remember the post I did about the crazy cherry tomato plant I grew a few summers ago? That thing produced tomatoes clear up until Thanksgiving that year. We had scads of the sweet little treats picked every day filling up a bowl on our counter and we were running out of things to do with them. 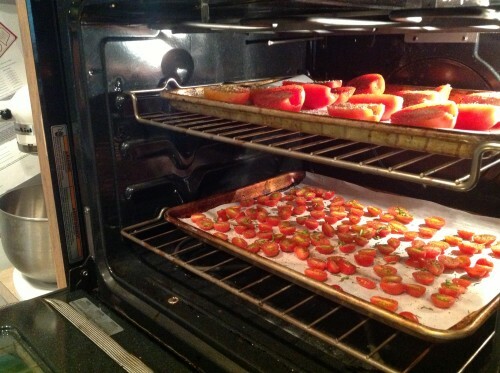 This year, tomatoes are actually growing in Oklahoma, and I am getting a head start on recipes for them as my current two plants are just now starting to produce the little candy-like tomatoes so I’d love to show you what I did last night! Before you start, I should warn you that you’ll need to plan to do these when you’re not in a hurry to go anywhere. 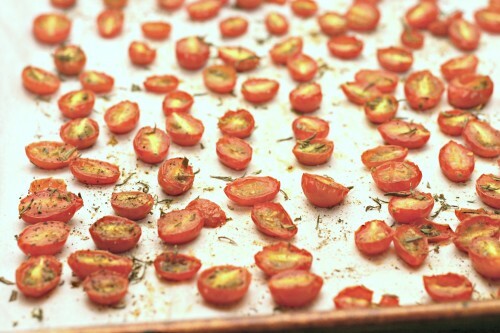 My first pan of cherry tomatoes took roughly around 2-2 1/2 hours and the larger tomatoes can take up to 5 or 6 hours. You’ll need to pre-heat your oven to 200º and slow dry them until they’re chewy and leathery, like a raisin. This is the perfect recipe because you can actually forget about the oven for two whole hours and nothing will burn! 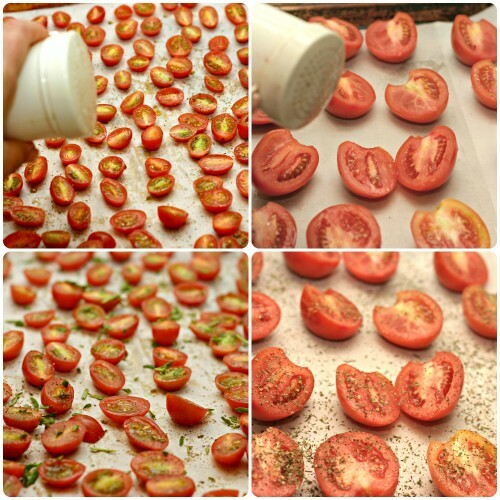 Take your cherry tomatoes and slice them in half. Here’s a shortcut to help you slice them quicker. 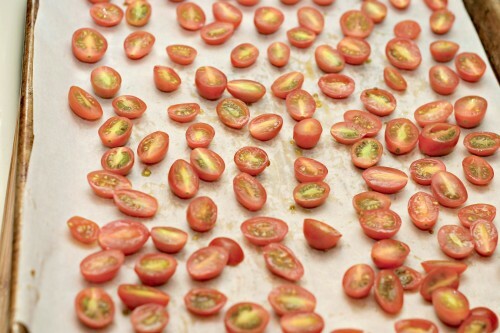 I also decided to try a pan of Roma tomatoes, so I sliced those as well. 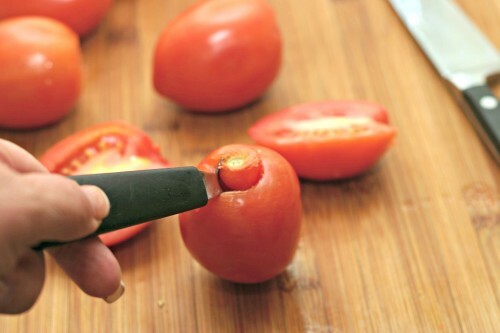 Make sure on the Roma’s or plum tomatoes that you remove the icky stem spot. Line a baking sheet or two with parchment paper, or if have a baking rack that fits into your baking sheets, that would be even better. Most people don’t, however, so I decided to do mine on parchment paper. 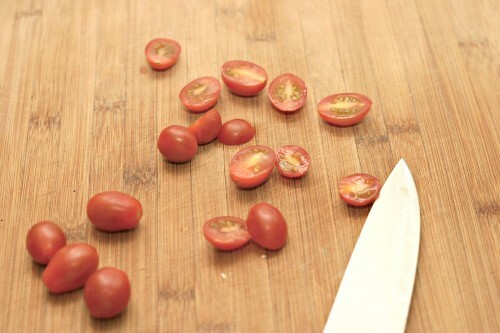 Lay your cut tomatoes out in a single layer, not touching at all, and with the cut side facing up. They will shrink by about one-half when they are roasting. You will be surprised! Well, except now you won’t because I went and told you didn’t I? I did the same with my larger tomatoes. Then I sprinkled them with salt and pepper. You can also add any herb you like. 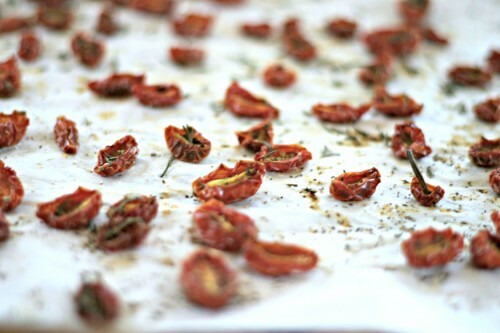 I experimented with both fresh and dried herbs by putting fresh rosemary on the cherry tomatoes and dried basil on the Roma’s. And that’s it. Some recipes call for drizzling with olive oil, but it really is not necessary and many advise against it. Just pop them into the oven. Turn on the timer for two hours. That’s when I first checked my cherry tomatoes. Each oven heats differently, so you’ll have to eyeball these to see when they finish in your oven! This was at the end of two hours and I although they were shriveling a bit, I still saw too much moisture. So I popped them back in for an additional half hour. When I checked them at that point, the moisture was gone, and they were leathery and chewy, but not crisp (don’t do crisp!). Their color had deepened to a brilliant red and they were just gorgeous…don’t you think? At this point, I allowed them to fully cool and packed them into a mason jar and drizzled a little olive oil over them. From what I’ve read, you can keep them in your refrigerator for months this way. Other options included vacuum sealing or double bagging them and squeezing as much possible air out of the bag before freezing and they will keep for up to a year (do NOT add olive oil!). Old school Italian cooks will tell you not to refrigerate them, but to make sure your mason jar is pristine and spotlessly clean, add olive oil, and keep them out in the pantry so as not to dilute the sweet and tangy flavor of the tomatoes, but I just am not sure about the safety of that so I won’t advise that way. However you decide to store them, you must make these soon! 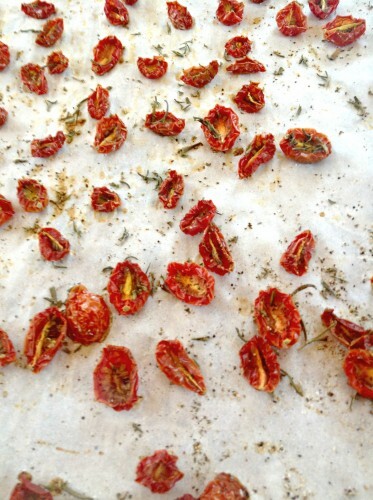 From snacking on each gloriously “bursting with tomato flavor” bite, you can either snack on them fresh out of a bag, or pluck them from their olive oil bath and use them in pasta salads, sandwiches or pasta. 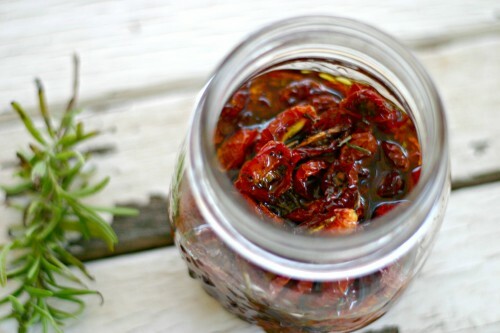 Try blending them in with your pasta red sauce for an added burst of depth of flavor or make the Pesto Rosso (sun-dried tomato pesto) I made yesterday. You’ll love every savory bite! Katie’s love of cooking and eating good food has led her down a path of fun filled friend and family gatherings around the kitchen. She is an Oklahoma Food blogger, TV food personality for Freedom43tv, author of Food Lovers’s Guide to Oklahoma and lover of all all the good things of life! If you like this post, you might like these as well!Thanks for visiting my blog! I love comments! Please feel free to leave one! This entry was posted in Vegetable and tagged Sun-Dried by admin. Bookmark the permalink.